The internet has become an inseparable part of our life. Over the past decade our internet speed and data consumption has increased a lot. Downloading large files, watching online videos and browsing the internet have become our daily routine. Now most of us have multiple internet connection available all the time. We have wired broadband internet connection at home and 3G or 4G mobile data connection on mobile or through 3G modems. I always wished to combine multiple internet connections and speed up the internet. But there was no process or software available to do that and Windows cannot use two internet connections simultaneously. A few months ago I came to know that Connectify, the company behind the popular Connectify Hotspot is working on a new software called ‘Connectify Dispatch’. This software lets us combine multiple internet connections into one and use them simultaneously for faster download speed. Now this useful software is released and available for download. Connectify Dispatch is a revolutionary software, no other similar software available right now. Using Dispatch we can use our high speed home internet connection and combine it with 3G/4G mobile data connection to get the fastest internet experience with maximum reliability. Connectify Dispatch intelligently balances internet traffic and accelerate internet speed. You can experience the increased speed when downloading multiple files, using BitTorrent or opening multiple web pages at once. It will make the internet more reliable, if one connection fails accidently, it can automatically switch to another connection. Connectify Dispatch comes with Hotspot feature which lets you create Wi-Fi hotspot and share the combined internet connections to any Wi-Fi equipped devices. How to combine internet connections and speed up download speed? Let’s see how to use Connectify Dispatch to speed up internet experience. First connect your computer to more than one internet connection [Broadband, DSL, Dial up, 3G, 4G etc.]. Then download and install Connectify Dispatch. The software is very small in size; it’s just around 5MB. After completing the installation process you have to reboot computer. Click on the Connectify icon on the Windows system tray and open the application. The user interface of the software is very simple and easy to understand. Navigate to ‘Dispatch’ tab and click on ‘Show Dispatch’ to open the Connectify Dispatch user interface. Dispatch will automatically detect all the internet connections available to the computer. Click on the ‘Start Dispatch’ button to merge all the internet connections. Now Dispatch will use client side load balancing technology to combine all available connections. It will show real time internet speed graph of all internet connections and combined speed. I’ve used two wireless internet connections to test the actual performance of Connectify Dispatch. My first internet connection speed is 1Mbps and second one is 2.8Mbps. I was very curious about the real life performance of the software. After enabling Dispatch, I’ve noticed huge speed improvement. Maximum speed was around 3.8Mbps and on average I was getting around 3.6-3.7Mbps. Connectify Dispatch has some limitations also. The increased speed can be experienced when we are downloading files via download managers like Internet Download Manager (IDM) or Free Download Manager (FDM) or using BitTorrent. If you are downloading files using browser, you may not get maximum speed. Due to some technical limitations Dispatch cannot speed up video streaming speed. Connectify Dispatch is a great piece of software. If you have multiple internet connections available, then use Dispatch to accelerate the internet speed. There is no other software available right now, which can do a similar task. Lifetime license of Connectify Dispatch costs around $59 and it comes bundled with Connectify Hotspot. You can individually purchase lifetime license of Dispatch for $50. You can also opt for quarterly payment option which ranges between $9-10. You can even test drive Connectify Dispatch for 3 days for free. Just follow this link to know more about it. This software works on Windows 8, 7, Vista and XP. It will not work on Windows RT. Dispatch can be used on Mac OS X with the help of virtualization technology such as Parallels Desktop or VMWare Fusion. If you are already using Connectify Dispatch, do share your experience with us. Whom are you trying to scam/confuse? Be aware, this software doesn’t work in Mac. According to Connectify Dispatch guide- “Dispatch will work on a Mac running OS X with the help of virtualization technology such as Parallels Desktop or VMWare Fusion”. Sorry, I was a bit rude first. But, my point is, virtualization is a different story. It is misleading to say an application works in mac if it works via virtualization. Almost any windows application can work under virtual environment; then, you are going to say that every windows application works in mac. That is not correct; rather misleading for the user at worst. I’ll update the articles to clear the confusion. Personally i wouldn’t say that because it will run in a windows vm means its mac compatible. The software itself is great and I’ve been using it personally for the last few weeks without issue, doesn’t really have any competition out there either, its well refined and offers a great deal of control. Unfortunately the pricing is insane, having it as a yearly subscription service is ridiculous, its software and its not like anything goes through connectify servers. They only recently added lifetime subscriptions and at around $100 in this ‘sale’ its still probably 3-4 times what would be a reasonable sum to pay. Extorting customers like this is a shame, the software is good and i’m sure if it was reasonably priced there would be a substantial market for it. I expect 90% of their user base will come from pirate copies in no time, i can’t find any sympathy for them either. Any giveaway for this piece of software?? Nice Post, I would definitely like to see if it would optimize my speed and experience but if it did then this would benefit me greatly. Thanks for sharing! but how to get licence key of connectify dispatch????????? I purchased this software before couple of weeks. It works, it increases your speed. It is definitely a good software. But there are some things which need to be fixed. Hopefully it will be fixed in future. But this is not scam. This software rocks! Thanks for your feedback. Can you please share the problems which you are facing when using Dispatch? Very interesting article post! I’m excited to try this one and see if it would really optimize my internet speed. Thanks for sharing! 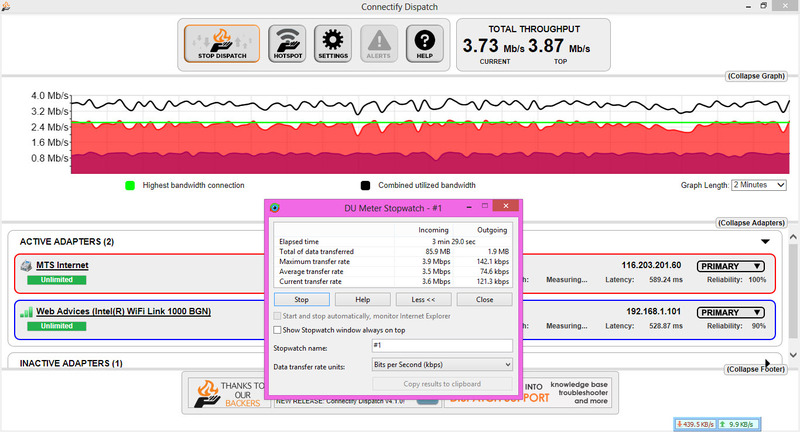 Thank You for listening Sir………..
Connectify Dispatch is a cool software that lets us combine multiple internet connections into one and use them simultaneously for faster download speed. It has awesome Hotspot WiFi features. Please count me in the draw too. Is this for real? This means that even if I have multiple computers my internet connection will still be fast? This is really something to try for. I definitely want to try this.